While the nation’s prisoners are predominantly people of color, the officials who put them there are overwhelmingly white -- to an extent that surprises even those who study racial bias in the criminal justice system. A stunning 95 percent of the nation’s elected prosecutors are white, a new report reveals. The data, compiled by the nonpartisan Center for Technology and Civic Life, was released Tuesday by the Women Donors Network, a group of about 200 female philanthropists dedicated to social justice issues. 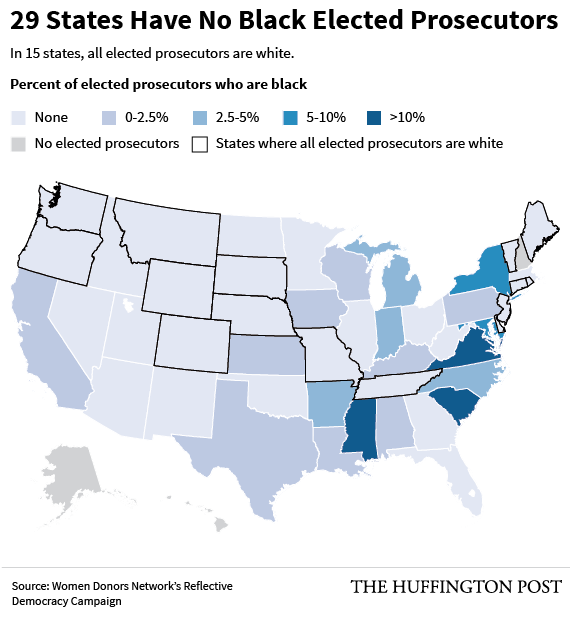 White men constitute 79 percent of the country’s 2,437 elected prosecutors. Only 4 percent are men of color and only 1 percent are women of color. The study looked at state and local prosecutors -- not those on the federal level, who are appointed. Perhaps more than any other official in the criminal justice system, a prosecutor has remarkable discretion over who gets charged with a crime (or a misdemeanor) and how long someone will spend locked up for an offense. 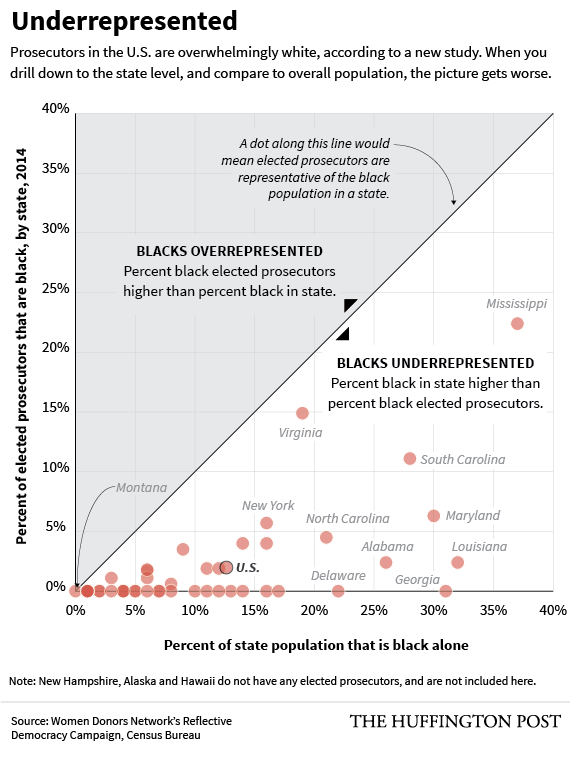 Again and again, prosecutors use that discretion to come down harder on people of color. The stats are well-known: Thirty-seven percent of men in prison are black, according to recent data from the Department of Justice. Yet black people make up only 13 percent of the population in the U.S. Black men are six times more likely to be incarcerated for a crime than white men, according to data from the United Nations. Take stats from just one city as an example: In Milwaukee prosecutors declined to try 41 percent of whites arrested for possession of drug paraphernalia, compared with 27 percent of blacks, according to a yearslong study cited by Jeffrey Toobin in The New Yorker. Black prostitutes were more likely to be charged than white prostitutes. Blacks were more likely to be charged for resisting arrest. As an increasing number of cases settle outside of the courtroom, prosecutors increasingly are the ones meting out justice. “Over the last 25 years, the most critical decision maker in the criminal justice system has become the prosecutor,” said Bryan Stevenson, founder and executive director of the Equal Justice Network, a nonprofit that provides legal services to impoverished defendants and prisoners. The numbers are particularly compelling considering the recent failure to indict the police officers responsible for killing unarmed black men in Ferguson, Missouri, and Staten Island, New York. In Ferguson, the prosecutor’s office failed to bring specific charges against police officer Darren Wilson in the killing of 18-year-old Michael Brown. In Staten Island, a grand jury failed to indict the police officers responsible for the choking death of Eric Garner. It is incredibly unusual for a prosecutor to fail to get an indictment, studies and experts have noted -- except in cases involving police officers. There are so few prosecutors of color that it’s hard to make broad claims about what they would do differently. But it’s apparent that a more fair system would include a more diverse group of people in power. In a call with reporters, Stevenson also brought up the striking example of Marilyn Mosby, the African-American prosecutor in Baltimore who charged six police officers in the killing of Freddy Gray. The 25-year-old black man died after being placed in police custody. He hadn't committed a crime, Mosby said at a news conference. “To the people of Baltimore and the demonstrators across America: I heard your call for ‘No justice, no peace,’” Mosby said in May. “Your peace is sincerely needed as I work to deliver justice on behalf of this young man." Mosby, unlike prosecutors in Ferguson and Staten Island, acted quickly to charge the officers and was widely credited with calming Baltimore residents who were outraged over Gray’s death. It seems pretty clear that her background made a difference, Stevenson noted.